Saturday Partly cloudy. Areas of fog in the east early this morning. High chance of showers in the east, slight chance in the west. The chance of a thunderstorm in the east during the afternoon. Winds E 20 to 30 km/h. Sunday Partly cloudy. Areas of morning fog in the south. Medium chance of showers on and east of the ranges, near zero chance elsewhere. Winds E 15 to 25 km/h. Monday Partly cloudy. 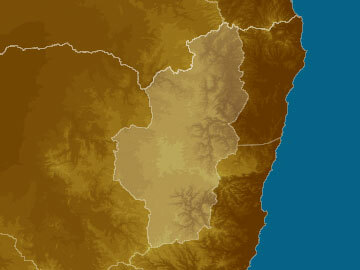 Medium chance of showers on and east of the ranges, most likely in the morning and afternoon. Near zero chance of rain elsewhere. The chance of a thunderstorm in the south in the afternoon and evening. Winds NE/SE 15 to 20 km/h becoming light during the day then becoming E 15 to 20 km/h during the evening. Tuesday Partly cloudy. Medium chance of showers on and east of the ranges, slight chance elsewhere. The chance of a thunderstorm in the morning and afternoon. Winds NE/SE 15 to 20 km/h becoming light during the day then becoming NE/SE 15 to 20 km/h during the afternoon.